Texas only AMA Motocross State Championship Series. Each year motocross riders in the great state of Texas have the opportunity to earn their place in history and be awarded and acknowledged as Texas AMA District Champions in all three districts which then qualifies them to move on to the AMA Texas State Championship Final and be crowned State Champions. Each district championship also has its own prestige and overall awards. 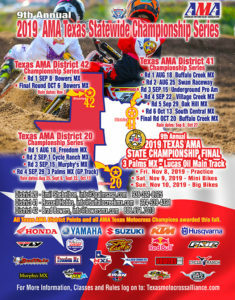 Since AMA District Racing was established in Texas in 2011 was have seen great racing and growth every year. The top riders which accumulate the most points in each qualifying series will be the AMA District Champions and the top 16 will move on to the AMA Texas State Championship Final (top 8 in District 42). All riders must qualify at the appropriate races in their home district to move on to the State Championship Final. Riders from any district or state may compete at all qualifiers all over the state but will be eligible for qualifying points only in their home district (determined by address of residence). Out of state riders must choose one district in which to accumulate points and call their “home” district. All riders will want to race all rounds in their district to earn as many points as possible. Each district will produce one Texas AMA District Champion every year in each class. All rounds that riders compete in count towards their point accumulation. All riders will want to race all rounds to earn as many points as possible. AMA Texas State Championship Final is a 2 day race format with practice on Friday. Awards for 1st through 5th presented at each district race. AMA District Series overall awards 1st through 5th place presented at the final round in each district. Riders must be present at the final round to receive overall awards and contingency. The top five riders which accumulate the most points at the end of each district series will receive overall awards and contingency for that district. $40 per class race entry for District races, $50 per class entry for Texas State Championship Final. $15 per person weekend gate fee for district racing. $10 camp fee per vehicle per day, RV hook up offered at some facilities. Saturday Practice fees vary per venue. AMA membership required and available at these races.